As much as I love to make everything from scratch, sometimes it's just easier to throw everything into a bowl with a mix and you're good to go. That's usually the case when I'm in the mood for corn bread. It's absurdly simple, and it takes no time at all. The thing that turns up the volume is the addition of creamed corn. It makes it sweet and moist and yummy. I guess it's more of a recipe variation than a recipe (since you follow the directions as written on the box), but it's still worth mentioning! So, the next time you use a corn bread mix, crank it up a little. It makes it so much better! Put a 12″ cast iron pan in the oven at 375F for about 15 minutes. Mix together the 2 boxes of Jiffy Corn Muffin Mix with the eggs, milk, and creamed corn. Pull the pan out of the oven, drop in the butter and swirl it around, make sure it gets up on the walls of the pan. Pour the batter into the pan, and bake for 30 minutes. Let it cool for a few minutes, run a spatula up under the pan to loosen the corn bread. Flip it onto a plate and serve. Since there's only one of me, I usually cut the recipe in half and bake it in a smaller cast iron pan. It works just as beautifully. I guess you don't have to specifically use Jiffy brand corn muffin mix, but it's usually the one that I buy. I always use this as a side note to go along with a meal, but if you want something more substantial, have a look at Chris and Dan's Cracklin Bread. 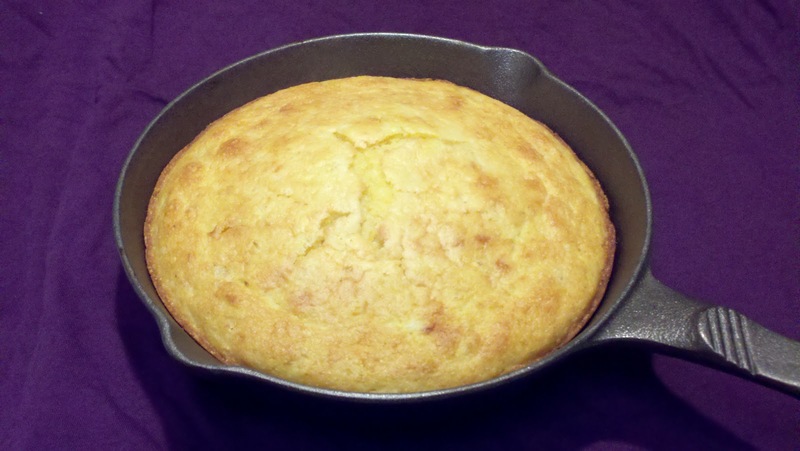 It's kind of the same sort of revved up corn bread idea, only you add breakfast ingredients. Love it! I'm so glad I came across this recipe!! I used to have it in my collection and it was lost in a move and I hadn't found another one with these ingredients since. Thank you :) i'm definitely making some with dinner tonight!